"i’d been fighting this candida issue in my throat and i had to really change my diet and use different medication and it sort of seems to pop up and its kinda hilarious. It’s like I have this new neighbour that i have to sort of learn to live with. And obviously you know this fungus is inside all of us and it’s never about eliminating it. You have to kind of just live with it." On first hearing the song "virus" might sound like a slow, elegant waltz of lovers, but Björk’s lyrics describe the deadly dependancies between species in the natural world. In the Virus app, infectious agents attack a central cell, multiplying faster than they can be destroyed. With each new stage of the virus’s life cycle a new section of song plays. Musical and biological processes unite : hang sounds (metal drum) are produced by movement of cells ; the sound of the gameleste (a cross between gamelan and celeste) multiply with the viral attack ; and the lyrics sing of fatal attractions. This is nature deadly and dangerous. In ’virus, Björk captures her relationship with a recurring throat infection —candida, a normal part of the human body system but one which causes infections when it overgrows. Fungi such as candida grow in a close and long-term relationship with plants and animals —what’s known as "symbiosis"—and it’s this bond which Björk describes. Björk’s lyrics reference well-known symbiotic relationships : mushrooms and trees, viruses and human. Viruses, features in true app, are incredibly abundant and found in every ecosystem on earth, infecting animals, plants, and bacteria. Whereas animal species replicate cell division, viruses need a host cell to make copies of themselves, sometimes lying dormant, but often resulting in the death of the host cell. The virus app takes you through the drama of this life cycle. Björk’s deadlier inspirations for virus include parasitic symbiosis in which one organism benefits at the expense of another, often by taking over the host, or even changing the host’s behaviour — an alarming analogy for love between humans ! For example, a parasitic worm infects the garden snail, making its eye stalks swell and throb with larvae so that the stalks resemble caterpillars, and causing the snail to crawl to the top of foliage at sunrise—something they would never normally do. This lures birds to eat the larvae with reproduce in the gut of the bits who excretes the eggs, and these are then eaten by other snails who themselves become infected. Another inspiration from nature was the control of ants by a parasitic fungus : the fungus attaches to ants as they cross the forest floor and releases chemicals in the ants’ bodies that cause them to fix to leaves a certain height from the floor where they die. the fungus then sprouts from the head of the dead ant and the spores drop to the ground, starting the cycle again. Listen to the song’s juxtaposition of its grim subject matter with its romantic-sou ding music —an irony you’ll find more often in the music of the sugar cubes, of of Björk’s earlier bands, than in her latest solo work. We get a musical hint that all is not well in the symbiotic relationship just before the fourth verse when there is a sudden shift to a new key, wild modulation, and pitch bends in the choir on the lyrics "you fail to resist". 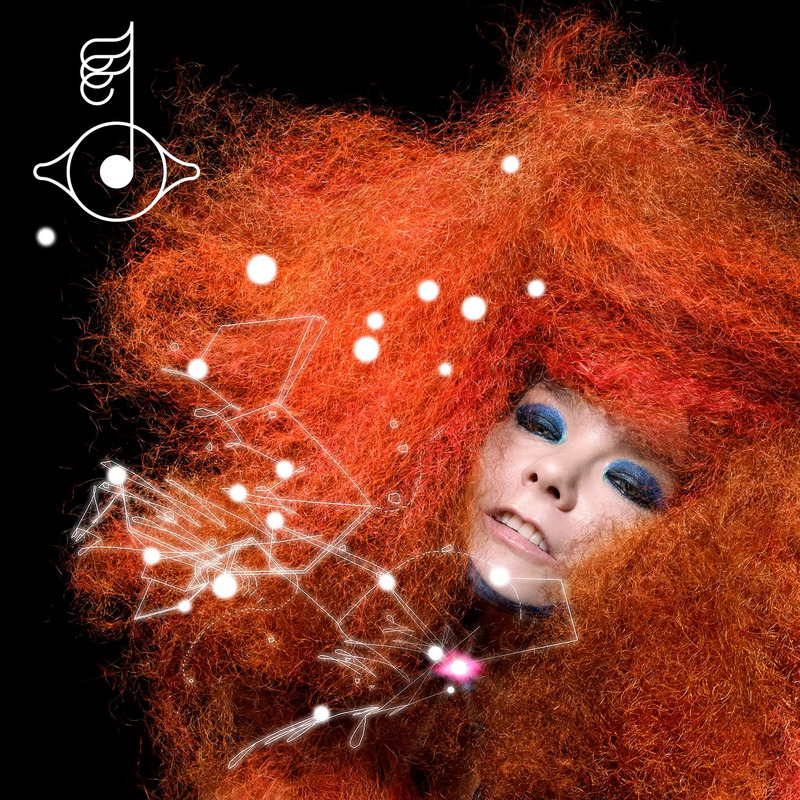 As in other tracks from Biophilia, Björk uses musical sound and structure to communicate her ideas in "virus". For instance Björk took the idea of a virus multiplying and created its sonic equivalent in the busy gameleste arrangement, using a generative music program —a sequence of rules expressed as an algorithm (a set of mathematical interactions) which operate on musical material put into the program such that the compositional process takes on a life of its own. Instruments containing copper, like gameleste, cymbals, brass and hang (a bronze flying-saucer-shaped object struck with the fingers) appear throughout Biophilia and it was a happy coincidence when Björk discovered that copper was used to cure candida. The use of generative computer programme highlights the similarity between biological and digital (computer) viruses, linking the themes of music, nature and technology that run through Biophilia.